If you have ancestors from Ireland who received an army pension between 1724 and 1924, come explore Fold3’s collection of Royal Hospital Kilmainham Pensioner Discharge Documents! The Royal Hospital Kilmainham, located in Dublin, Ireland, was founded in 1679 and handled the pensions of Irish Regiments (as well as some English, Scottish, and Welsh units, though most pensions for non-Irish regiments were handled by the Royal Hospital Chelsea in London). The Royal Hospital Kilmainham was originally built as a home for retired soldiers, and as such, some of the men who qualified for pensions were “in-pensioners,” which meant they surrendered their pensions and lived at the Royal Hospital; however, many more were “out-pensioners,” meaning they received their pensions while living elsewhere. The hospital dealt with pensions for regiments in the Irish Army Establishment until 1800, when the British and Irish Army Establishments were combined. In 1822, the out-pensions administered by Kilmainham were shifted over to the Royal Hospital Chelsea; however, soldiers discharged in Ireland were still examined at Kilmainham before their information was passed along to Chelsea until the 1860s, and in-pensioners continued to live at Kilmainham until 1929. Veterans were eligible to receive a pension if they had a disabling injury and had either been invalided home or completed 12 years of service. Officers’ pensions were not typically handled by the Royal Hospital Kilmainham, as pensions were usually awarded to officers through the “half-pay” system. On Fold3, this collection is actually in two parts: the Pension Admissions and the Pensioners’ Discharge Documents. The records fall between 1724 and 1924. The Pension Admissions are registers of in- and out- pensioners of the Royal Hospital Kilmainham. The pensioners in these books are typically ordered by the date the veteran was examined for pension. Information found in these registers can include name, regiment, rank, length of service, illness or disability, birthplace, occupation, physical description, and more. Admissions registers for earlier years contain less information than those for later years. 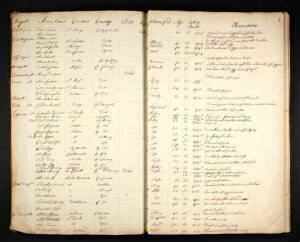 The Pension Admissions section also contains two registers of in-pensioners (covering 1839 until 1922), as well as a register of pensioners living abroad (1819-1822). The Pensioners’ Discharge Documents contain pensioners’ certificates of service. These documents may contain service history information (corps, rank, years of service), as well as the man’s physical description, trade, birthplace, medical condition, and more. On Fold3, the records in this title are grouped first into Admissions and Discharge documents as mentioned above. The Pension Admission Books are then typically arranged by date. The Discharge documents are also roughly arranged by date; however, they are more specifically arranged by the veteran’s discharge number, an index to which can be found in Pieces 1–12 of the Pension Admissions. This all being the case, knowing the approximate date your ancestor was awarded his pension (or at least the rough dates when he was drawing his pension) will make it easier to find him in this collection, as you will need to browse rather than use the search tool. Start browsing the Ireland, Royal Hospital Kilmainham Pensioner Discharge Documents on Fold3! Searching Mullis surname in British military records through 1787.